Creative thinking may be your most crucial competitive advantage going forward. But it's not enough to have a creative CEO or General Manager. You need a management team of creative thinkers and a creative workforce. This should be foremost in your thinking, and maybe it should be the theme of your next conference, business meeting or event. So begin fostering creative thinking within your organization with a creative thinking workshop, and bring Roger Reece in as the keynote speaker at your next event. Roger is a dynamic motivational speaker, and as your keynote speaker he will set the tone for your event with a fun and challenging program to crank up the energy level of your audience. Roger's speaking style is natural, energetic and filled with humor. His presentations include personal stories, real-world illustrations of concepts & techniques and engaging multimedia. He walks out into the audience with a microphone and gets everyone involved in the presentation. He is especially good at taking research from multiple fields underlying complex and new concepts and methodologies, and distilling it down into practical, down-to-earth applications for improving day-to-day work and life. With every presentation he delivers a call to action, focusing on ownership and a commitment to personal and organizational growth. Roger Reece is perfect as opening speaker for your conference, getting everyone mentally charged up for the event, or as closing speaker, sending the audience home on the right note. 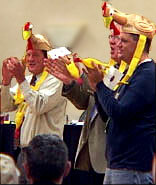 If you are planning to include a dinner or awards banquet, you might also consider Roger as your after-dinner speaker. Throughout his sessions he drives home the importance of creativity in all aspects of business. 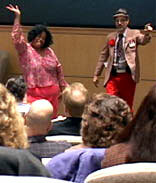 And his creative presentation techniques, audience participation and group exercises keep people engaged in the power of creativity. Contact us for Roger's fees for a single presentation or a package. Your program with us can include any combination of presentations, breakout sessions and training modules. Roger will challenge your audience about how they think, work and live their lives. We all need to be more creative, in our work and in our personal lives. We need to wake up to the opportunities that are all around us in every thought, decision and interaction with our team members. Roger will challenge your mental models and your habits; he will challenge the neural pathways that govern your thoughts. Creative thinking is essential for running your business and managing your life. The most effective presentation is a wake-up call to the audience; it is a charge to the psyche that results in action at all levels of an organization. That is what this keynote will do for you. Our behavior and our thinking go hand-in-hand, so the result of creative thinking is creative behavior. In his presentation Roger will look at the behaviors that hold businesses back. In today's competitive climate, we have to view these behaviors as self-sabotage, and we should immediately take steps toward eradicating the disease of stuck thinking wherever we find it. Roger's programs are all about transforming the thinking and behavior of organizations into creative cultures for success to grow organically, and where every member of the team rises to new levels of creativity, ownership and accountability. Roger's presentations are not a bunch of platitudes. He touches people where they live. His examples and explanations are practical and accessible, and geared to bring each member of the audience to reflect on his or her own behavior. 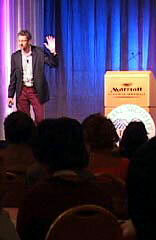 Roger Reece's keynotes are not for spectators. Everyone gets involved in creative activities and exercises that keep them highly engaged from beginning to end. The exercises force audience members to think - and they quickly discover how creative their thinking is. Some members of the audience are recruited to join Roger on stage, and they never know what they are being recruited for until they are already doing it. 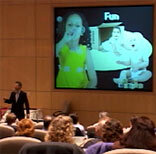 The result is a presentation filled with spontaneity, fun, humor and entertainment. Roger's philosophy is, why just talk about creativity? Why not give everyone a high-powered creative thinking experience? And that's exactly what his creative thinking presentations deliver. Double the Creativity with a Keynote Speaker "Tag Team"
Why settle for just one keynote speaker when you can have two for the price of one? If you decide to bring Roger Reece in to deliver a keynote or presentation on creative thinking, you can have a second motivational speaker at no extra charge: Roger's alter-ego, Buford P. Fuddwhacker. When selecting a keynote speaker, you always have a choice to make: humor or substance. 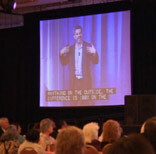 Humor is important, and most speakers can generate a few smiles and chuckles - but some speakers get the big laughs. 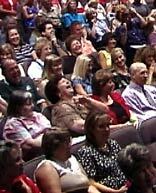 Those big laughs go a long way in changing the mood of the audience and generating real positive energy. But many big-laugh speakers lack any real substance, so you generally have to make a choice between humor and substance. But not with Roger and Buford. Roger delivers substance with smiles and chuckles, and Buford goes for the big laughs. If you select Roger & Buford as your motivational speaker tag team, Buford might open the program with music, a kazoo band (your audience), big-laugh motivational humor and hilarious audience participation. Buford is the perfect parody of the polyester, glad-hander motivational speaker. He's also a world-famous inventor, and he fills the room with positive-attitude babble and bizarre inventions. Within minutes, Buford is recruiting volunteers from the audience to assist him on stage, and transforming audience members into Elvis impersonators, American Idol contestants or Chicken Dance instructors. The ratio of Roger-to-Buford time on stage (they never appear at the same time) depends on your objectives for the presentation. Roger will work with you during the planning phase to design the perfect mix of elements for your audience. Creative thinking is a serious topic - but a big part of its message is that we don't always have to take ourselves so seriously. Sometimes it's good to laugh at ourselves, and realize that our thinking and our behavior are in need of an overhaul. Through all the fun exercises and laughter, Roger stays on point with the deeper message of personal change. His presentation closes with a serious call for more creative thinking and a call to action: for every member of the audience to use their creative energy to transform everything within their sphere of influence (including their own behavior). Roger's message is a charge to transform the culture of your organization into a creative hub, with the skills to stay ahead of the competitive power curve whatever the coming years bring. Your call to action is to look at your calender and find the next opportunity to bring in a speaker. Then contact us to get the wheels in motion.